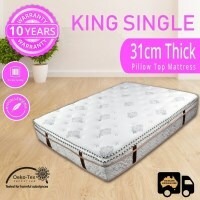 High quality mattresses from an Australian owned company. We abide by the best international standards, and use materials including ISO 9001, SGS, Oeko-Tex and Certi-Pur. Buy with confidence with an Australian warranty. Very comfortable.Im very happy with my purchase. The mattress is perfect fir my guest bedroom and it was delivered quickly. This mattress is fantastic. It came rolled up like a rug, I could not believe how small the box was. I let it sit for two days to re-expand and settle. It is very comfortable and much better quality than I was expecting for the price. Best purchase I've made all year! Hi just wanted to say yes this is the real deal !!!!! I purchased not knowing how this bed was going to be but we are so amazed at how a bed this big could fit into a box and still be a good bed it arrived in just 4 days .We allowed the 2 and 1/2 days to let it fully relax and then put all our amazing linen on it ready for the best nights sleep!! Yes its so AMAZING i cant believe i only paid. $380 for it that is so awsome!!! Im still in shock at how good this matress is THANKYOU SO MUCH!!!! I've had several heart surgeries so I know the importance of a great night's sleep and low pressure around my ribs to help be breathe easier and keep the sore chest away. After doing research on the many different types of springs, fabrics and layers that can go into a mattress for days on end, I was looking for best bang for buck without compromising too much on quality for around the $500 mark. $500 you say? that's not much for a mattress! Well actually, long gone are the days for paying $3000+ for special posture-paedic type mattress thgat cost you the earth butr were not comfortable overall. The old dinosaur inner wireed spring mattresses of yesteryear a re nothing but expensive gimmicks these days when you can get a much better sleep on a cheaper individually coil sprung mattress - and that's exactly what I did!! I had a checklist of the things I wanted in the composition of my next mattress and went through each mattress's detail by detail when sorting through dozens before making my choice. This Dolce brand mattress ticked all the boxes!!! It's got pocket springs, natural latex, anti dust mite, hypo-allergenic, pillow top/euro top comfort, 30cm+ of support, medium to soft feel, looked great and even came in under the $500 mark. I saw the same mattress in another online store for $1600!!! Anyway, Imade my purchase and it was delivered rolled up and vacuum shrunk inside a cardboard box - 2 man lift because it was very heavy. We placed it on the new bedframe and unsealed it. The smell at first is overwhelming of the new mattress materials but leave the windows open for a few days and it will eventually dissipate. Oh, and how does the sleep fee? ABSOLUTELY FANTASTIC!!! The best $459 I ever spent which included delivery to my door. It is so soft and luxurious to sleep atop. I couldn't believe I laid on mattresses 4 times the price at your mattress dealerships that weren't anywhere near as comfy!!! When I lay in it I drift off to sleep so quickly. So do my children. In fact even when family come over and try it out they cant believe how well it is constructed and how low the price I paid! Bye-bye costly inn-er spring dinosaur mattresses that used to cost me $3000, and say hello to the new technology and design in mattresses that are going to make the old inner-springs go the way of the dinosaur. I am writing this review about 6 months post my purchase of this mattress (now Sept 2016) and I still could not be more satisfied with making the choice of purchasing this "Eminence" mattress (which has been branded "DOLCE" on the side tags and you will find DOLCE in major furniture stores for sale much more expensive than what you will pay for them here). My parents are looking at purchasing a new mattress themselves, or maybe even two for their home. I know where the best bang for buck mattress is. Now you do too!. Rob.